Natural quinoline alkaloid camptothecin (CPT) is used for the treatment of colon, lung, breast and ovarian cancers still facing challenges due to low solubility in aqueous and biological fluids. Its lactone form easily converts into a toxic carboxylic form at slightly basic pH, typical in blood and tissue fluid has rapid clearance from systemic administration. We report a new approach based on micro crystalline cellulose (MCC) and nano crystalline cellulose (NCC) isolated from natural sources such as Cymbopogan flexuosus to stabilize and regulate the release kinetics of CPT in physiological solution. Langmuir and Freundlich isotherm studies approve that degree of crystallinity i.e. ratio of amorphous and crystalline cellulose regulate the adsorption of CPT. 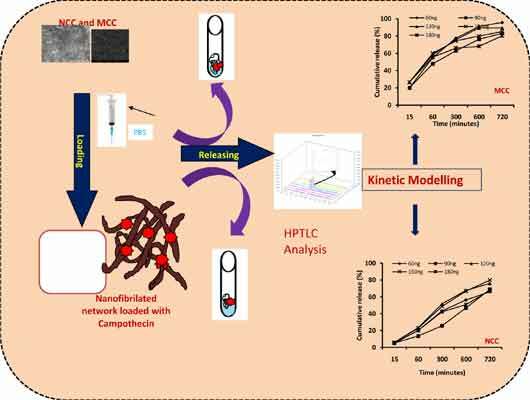 The freeze dried celluloses of Cymbopogan flexuosus origin (MCC and NCC) further were optimized for drug delivery with a mimicked physiologically relevant solution. Both carriers can significantly extend the release of drug as compared to reported values, however, NCC showed better results. Not only the crystallinity but crystal size and hydrogen bonding play critical role in drug release. Free diffusion of drug into physiological solution follows the Ritger- Peppes kinetic model. The coefficient of the model signifies the Fickian diffusion mechanism of release. The investigation indicates that NCC cellulosic matrix can act as a better carrier of CPT for its sustained release formulation. Nanocellulose, Camptothecin, Binding, Releasing, Kinetic data. Agronomy & Soil Science Div. Central Institute of Medicinal and Aromatic Plants, P.O. – CIMAP, Near Kukrail Picnic Spot, Lucknow – 226 015, India.